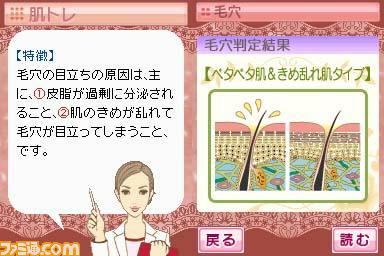 Japanese women will soon be able to have the wisdom of a beauty consultant in the palm of their hand. On November 27th, Sega will release their latest Nintendo DS title called Project Beauty. The DS title takes digital images of the users face, and then analyzes the position of their eyes, lips, cheeks, and nose among other features. It then offers makeup tips and shows examples based on what type of occasion selected (dating, business, formal.) You will also be able to test out colors on your skin to find matches you may have not considered. Project Beauty is being targeted to females in their 20s and 30s, but Sega hopes to have all ages of females interested. Not only does Project Beauty offer suggestions, but it also teaches you how to properly apply makeup. The game will sell for 6,090 yen ($55), but will include the face scanning hardware. Female readers, would you like to see a game like this for western audiences?